Need the strongest Truck Rack? Look no further, Pro II Steel Truck racks are made from beefy 2” round steel tubing with a wall thickness of .083” for strength and stability. Get the best….Get aKargo Master Truck rack! The Kargo Master Pro II Series Truck Ladder Rack is one of the toughest heavy-duty racks in the market. The Kargo Master Pro II Series Truck Rack is built with 2″ diameter round steel tubing that has a 1,700 lb. loading capacity. The sleek round tube design significantly reduces wind drag and noise and creates an uniform load distribution that results in a sturdier rack. All Kargo Master truck racks are treated with zinc primer and marine grade powder coat to achieve excellent corrosion and UV resistance. 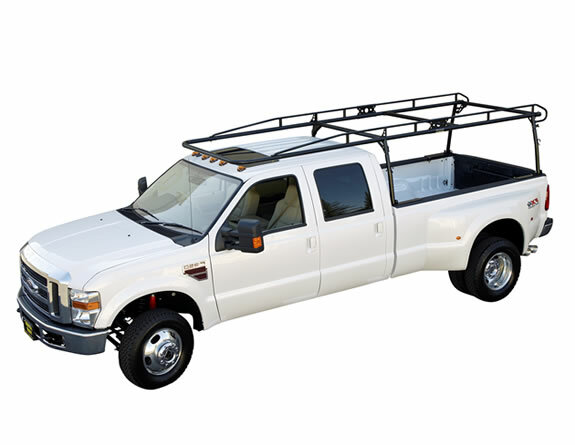 Pro II Steel Truck Racks are available for all full size trucks in a standard and extended/crew cab style that fits 6.5ft and 8ft bed lengths. 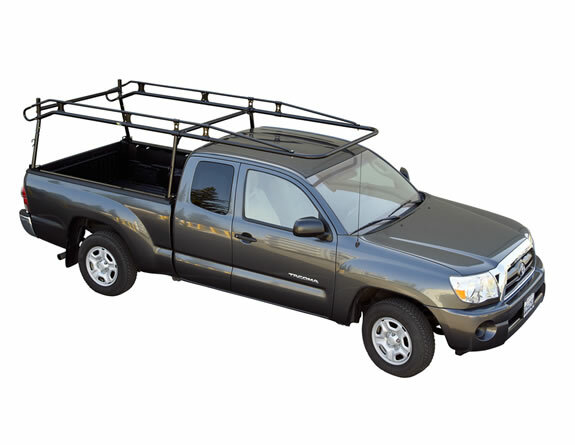 Extended length racks positions the front crossbar beyond windshield on extended cab trucks. This reduces wind noise, looks better, and provides more support for long cargo. Our Cargo Racks take lots of abuse in all types of climates without compromising style, strength and durability. The Pro II steel Ladder racks are Zinc Epoxy primed and powder coated black for superior corrosion protection. No one else gives you this type of quality finish. Are you looking to carry a couple ladders or moderate loads of construction materials? Why burden your truck or your wallet with a heavy rack that is overbuilt for the job? 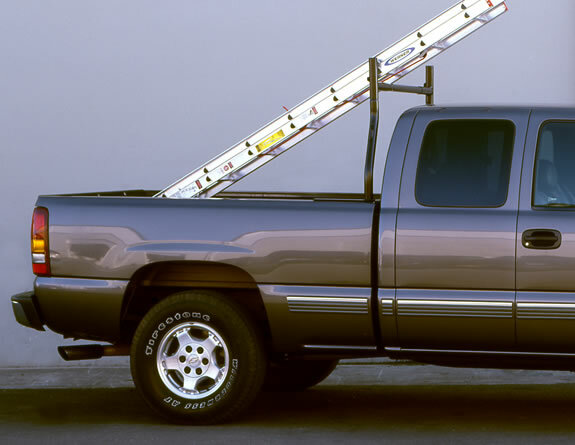 The PRO III Medium-Duty Steel Truck Rack is the perfect choice for you. This truck rack is made using rugged 1 5/8” dia. round tubing with a wall thickness of .083” for strength and stability. 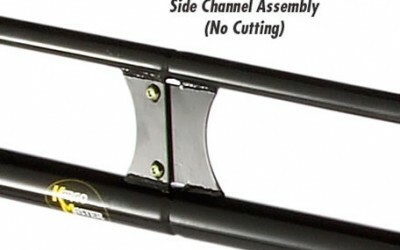 The Kargo Master Pro III Truck Rack has one of the most unique rack designs in the market. The Pro III Truck Rack is designed with adjustable front legs that allow the rack to fit trucks with long or short bed. Kargo Master Pro III Series Truck Rack also available on both medium and full size trucks with camper shell (KM80020/KM80030). The Kargo Master Pro III Truck Rack is built with 1-5/8″ diameter round steel tubes that offer a 1,000 lb. loading capacity. The sleek round tube design significantly reduces wind drag and noise and provides uniform load distribution that results in a sturdier rack . All Kargo Master truck racks are treated with zinc primer and marine grade powder coat to achieve excellent corrosion and UV resistance. The Kargo Master Pro III Truck Rack features 5″ swaged joints and gusseted cross bars for increased durability and strength. 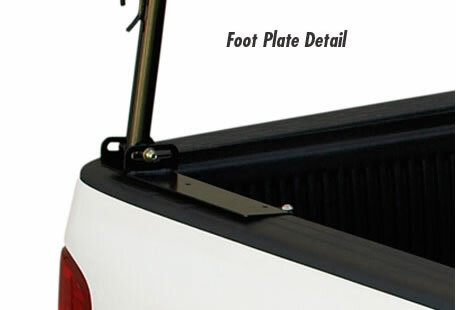 Full 17″ long pre-drilled foot plates ensure the cargo rack is securely fastened to your truck bed. 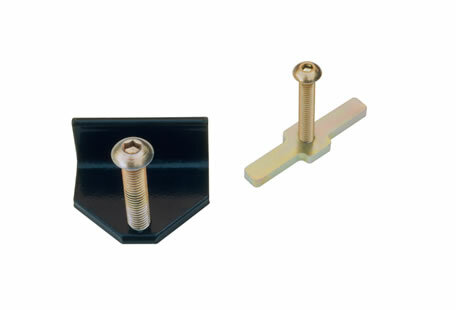 Convenient T-Bolts are included to minimize the need to drill your truck bed. 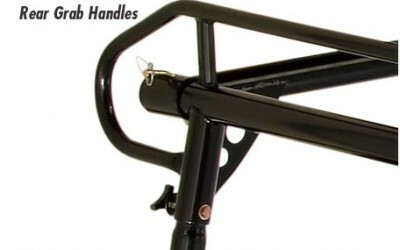 Rear Takeout Bar is designed to be removed without any tool to allow clearance for storing large objects or cargo. 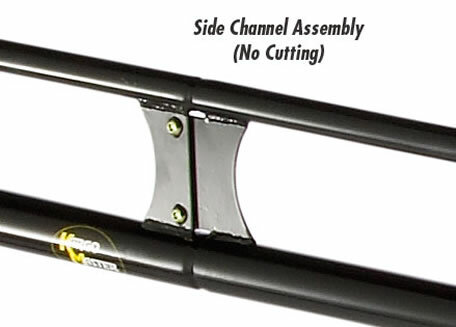 Rigid side channel rails are designed with a handy grab that loops at the back of the truck. The Kargo Master Pro III Series Truck Rack is a high quality rack that comes with an affordable price tag. Pro III Truck Racks are available for all Full, Mid, and Mini trucks, standard and extended/crew cab styles­­­ with bed lengths of 60”-90” — Will not fit step side trucks. 2” dia x.120”tk T-6 aircraft alloy tubing. Looking for something that will protect the back of your cab and rear window? The NEW Fleet Headache Rack takes away unnecessary headaches. Made from a thick steel frame, Fleet Headache Racks are available in a Louvered or Screen style rack. This is the industry’s BEST VALUEheadache rack. Yellow Zinc Dichromate fasteners resist corrosion up to five times longer than standard white Zinc fasteners used by competing brands. Self locking nuts stay tight. Lower cross bar has slotted holes to hold large items, motorcycles or quads securely against the bed bulkhead. Superior high quality cab protection. Easy to put on and take off with a No-Drill Clamp-On installation. “Dog Ears” included. Use is optional. Square vertical tubing provides support and enclose/hide emergency light wiring. Screened models have for superior cab protection and safety. Louvered models have 5 louvers to protect your cab from flying objects and the hot muddy sun. Optional tool box shims available. Heavy-Duty 3/16″ Dia wire screen. The Kargo Master Econo Truck Bed Rack provides a simple and affordable solution for reliable cargo handling. The Kargo Master Econo Truck Rack is constructed using 2″ steel tubes and designed with a loading capacity that holds up to 500 lbs and offers adjustable height from 24″ to 27″. 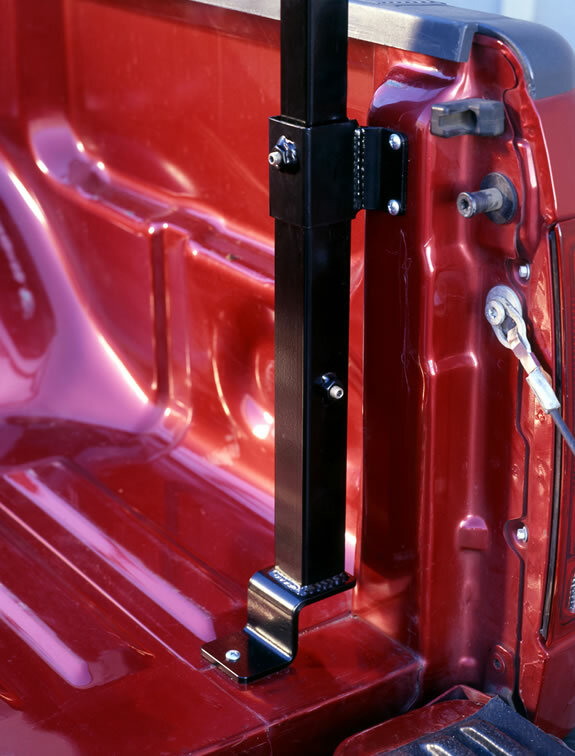 The Econo Truck Rack uses 1/4″ thick and 15″ long foot plates to spread load along truck bed rail and provide a flat forward mount for tool box. 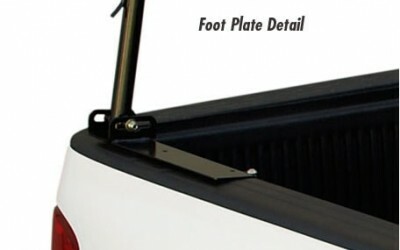 Foot plates attach to your truck bed using no-drill clamps are included in the box. 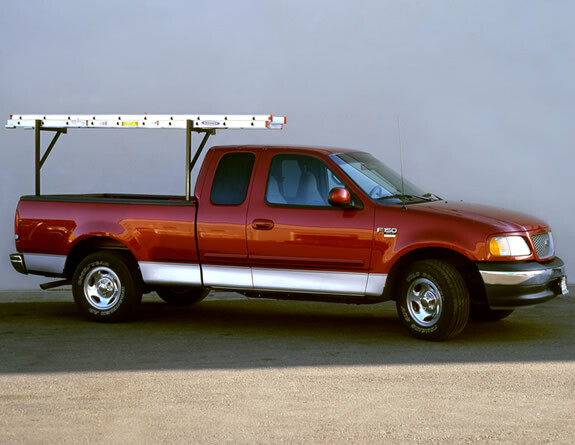 The Econo Truck Rack can easily be installed or removed when not in use. 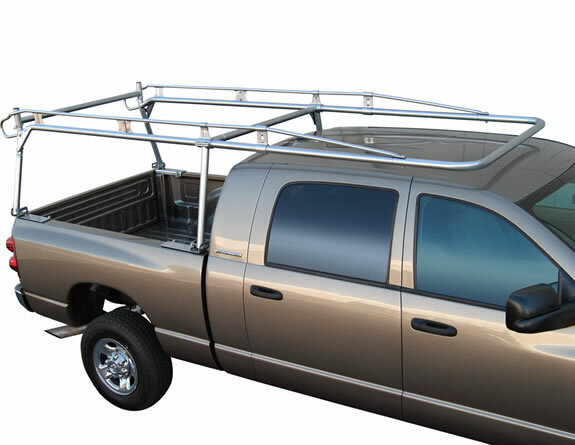 This unique design provides flexibility allowing user to mount a single set near the front of the truck bed or mount two sets to make a full length truck bed rack. All Kargo Master truck racks are treated with zinc primer and marine grade powder coat to provide excellent corrosion and UV resistance. 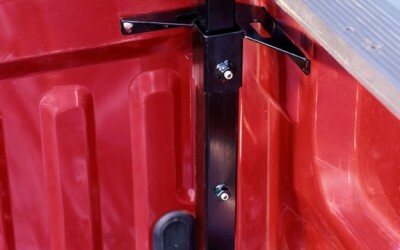 The Econo Camper Shell Rack can be easily installed or removed when not needed. Product sold in single set only. Drive your truck to a wedding today and the jobsite tomorrow. Sorry, you’ve gotta wash it yourself. But, the Kargo Master Quick Pac Truck Rack makes it easy to carry your stuff without detracting from the appearance of your rig. 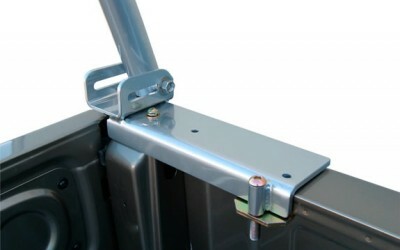 Upright supports remain permanently in place out of sight below the truck bed rails. The rugged 1 1/2″ square steel tube uprights are easily removed when not in use. 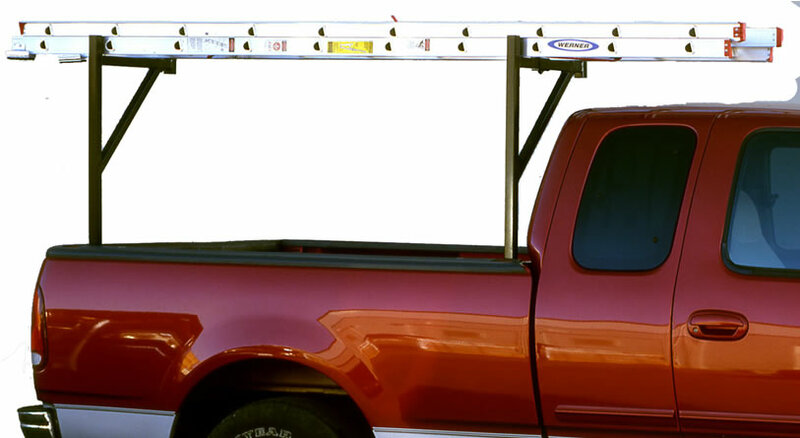 The Quick Pack Ladder Rack is perfect for carrying ladders, kyacks, lumber and other light-weight rigid cargo. Truck Ladder Rack – Rock solid 1.75″ square x .095″ upright support tubes remain attached, out of the way and out of sight. Uprights are removed and installed in seconds. The original BACKRACK™ maintains your truck’s stylish good looks while providing strength and functionality. We understand that your truck is a tool for your business as well as a representation of your business. Even though you use your truck for work you don’t always want it to look like a work truck. 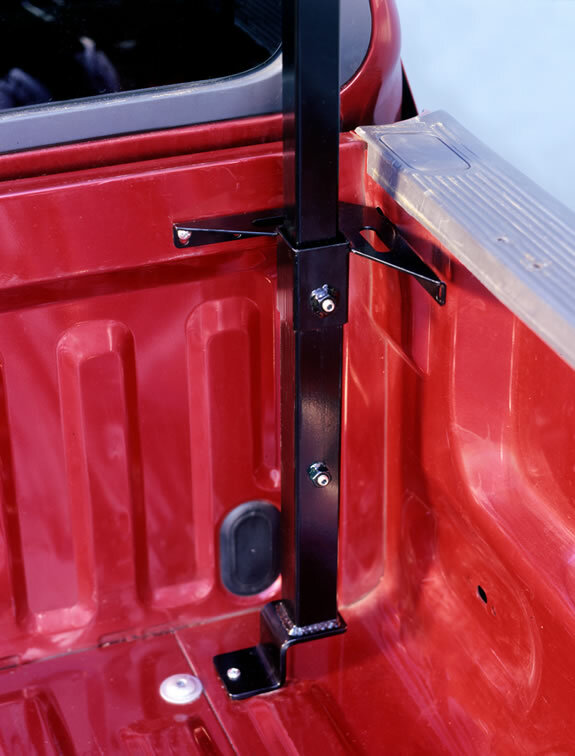 BACKRACK™ maintains your truck’s stylish good looks while providing you with a practical tool to carry ladders and long loads, secure shifting cargo, or mount most any type of light or accessory. 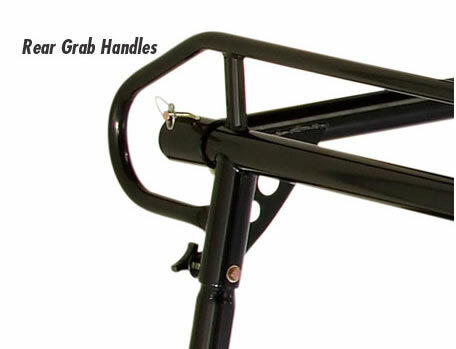 BACKRACK™’s simple and open design makes it easy to hook a bungee cord or ratchet strap around the flat bar. Rest a ladder or long lumber between the uprights and secure. Tie bulky cargo to the BACKRACK™ with the confidence knowing that your rear window and cab are protected from shifting cargo. Our three choices of HARDWARE KIT provide solid attachment to your truck. 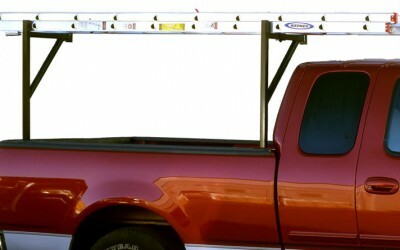 BACKRACK™’s low profile design allows you to park your truck in places you couldn’t with a full size ladder rack. In northern climates it allows you to park in your garage to keep the snow off your truck in the winter. Park downtown or at the airport in multi-level parking. 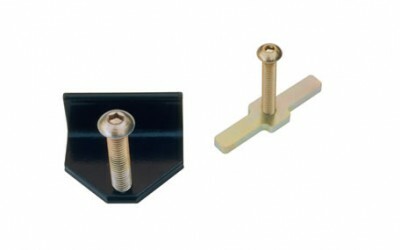 We even offer folding light brackets that hinge down to allow clearance when required. Truck Rack or Tonneau Cover? Now you can have both. 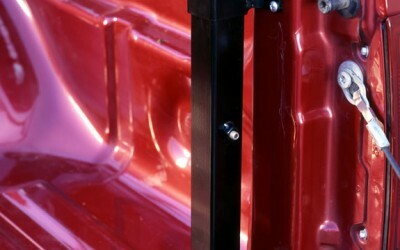 BACKRACK™ is fully compatible with certain Tonneau Covers. Are cab protection and employee safety your primary concerns? Safety Rack from BACKRACK™ is the solution you need. The SAFETY RACK provides complete coverage of the rear window while offering clear visibility through the two inch fully welded wire screen. If Cab protection and employee safety are your primary concern, then the SAFETY RACK is the solution you need. The two inch wire screen is manufactured using 3/16″ cold rolled wire that is welded at each and every intersection. Strong and rigid enough to tie to, yet easy to see through. The screen is robotically welded into a heavy guage two inch HRPO square steel frame. The generous width allows for increased ladder and cargo carrying capacity versus the BACKRACK™ Cab Guard. Add Light Brackets to mount lights and accessories. You need your trucks on the job site, not at the dealer waiting for accessories. BACKRACK™ products are available wherever truck accessories are sold. With our extensive Distributor network you can be sure that BACKRACK™ products are ready when your trucks are. SAFETY RACK Cab Guards bolt on in minutes and make the installation of lights and accessories both hassle free and damage free. No drilling required on most late model pickups. Truck Rack or Tonneau Cover? Now you can have both. 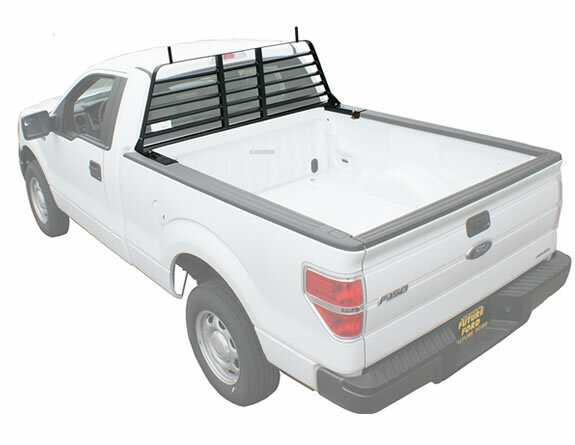 SAFETY RACK is fully compatible with certain Tonneau Covers.